Dust Girl by Sarah Zettel. Book 1 in The American Fairy Trilogy. 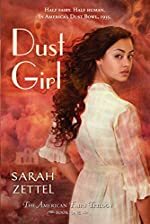 Review: Sarah Zettel has started off her new series with the great hit, Dust Girl. Callie LeRoux, small Kansas girl, had known all her life that her father wasn't coming back and that her mother was forever crazy for thinking so, but with the arrival of the greatest sandstorm in history everything in Callie's world has been flipped upside down. Her mother taken captive by the beautiful Seelie; her father, well thanks to the help of a stranger caught amongst the dust, has been locked up still trying to be forced to marry the Seelie princess. Callie has just experienced the worst shock of her life, the greatest dust storm in history, her mama gone for good, a man and his fortunes, and now meeting a young boy Jack Holland who claims Callie's a fairy. She found Jack on the way to get food for her new "costumers" in a prison cell humming along to an old railroad tune. Taking pity upon him she releases him and has her work for him, becoming incredible friends. Through tight locks, railroad busts, and undead sheriffs Jack and Callie's relationship has grown tighter and tighter. Even after the sudden disappearance on Jack and the change in Callie they remain everlasting friends. This book is for 2nd graders and up. The land of fairies and magical creatures has taken a new turn in this book. If you love magic and fairytales and happy endings then you should try out this book. The two part series has all the magic and fairies to last you a lifetime. Take a step into a small town Kansas's girl's life and experience all the adventures, danger, anger, love, and feelings of a girl lost in a huge world, or make that two worlds. Callie has discovered the land of the fairies, a huge world where her grandparents are king and queen, her father a prince, and Callie a princess. But this world is more dangerous than it seems, if a human or fairy eats or drinks from this world they can never leave. Sound thrilling? Go grab a copy of Dust Girl by Sarah Zettel today, you won't regret it. Review written by Emily (6th grade student). We would like to thank Random House for providing a copy of Dust Girl for this review. Have you read Dust Girl? How would you rate it?